Melissa Matters was a blogging friend who passed away suddenly in 2015. She was a mom, wife, daughter and friend to many. 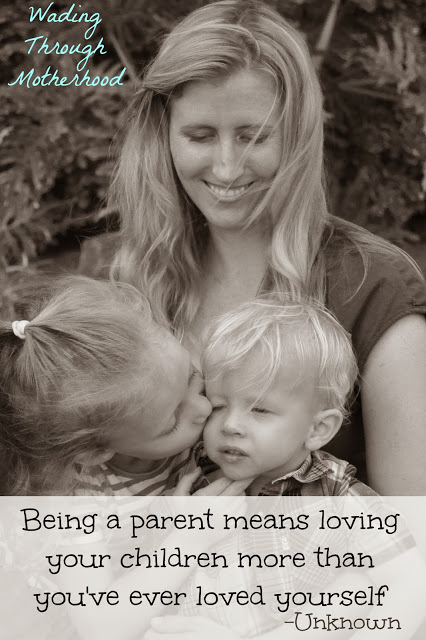 You can still read her blog, Wading Through Motherhood, which keeps her voice and spirit alive even years later. How to Help Children Express Their Emotions was her last post. Her birthday is in March, so I try to post about her every year around this time, and suggest some ways to show kindness to others in her honor. The photo below is from her website. My nephew, Joey, is frozen in time for me. I can still hear his laughter in my head. He was silly, funny, and mischievous, with big blue eyes and kissable chubby cheeks. He loved Finding Nemo and thought the word 'Dumbo' was hysterical. You would often find him with his favorite brown blankie shoved in his mouth. Joey left this world in 2013. Brain cancer stole him from us, and our lives will never be the same. But I try to remember the good and share his life with you, so he will never be forgotten. I hope you can help spread some kindness for me in his honor. I came across this picture of him recently. It was taken a few months before he was diagnosed, in 2013. That's The Jersey Momma's Boy in the background (you can see how happy he was to be with his cousin!). I am so glad that we had this moment together. Seems like such a silly thing, but I am grateful that the Branchburg Sports Complex had this open house that day. It is one of the fondest memories I have of Joey. I thank you for reading about these two very special people. I hope you can help me honor them by spreading some kindness today. I've listed a few ideas below, some easy ways you can help spread a smile. Last year we participated in the HEALium Hugs program, which was created by my friend Jill, and delivers mylar balloons to children in hospitals. The year before that, we donated to Operation Christmas Child. So let's see what we can do as part of Everyone Matters this year! Everyone Matters is a campaign to spread something positive. You are important. Your words are important. What you say and share with others matters. We are all connected in this life, whether we realize it or not. How Can I Participate in Everyone Matters? send an email, write a note, text or call someone you haven't spoken to in a while. Tell them you love them! let someone get in front of you on the checkout line. Seems like such a simple thing but it is just one small act of kindness, to let someone go ahead of you. write a note to your child's teacher or caregiver. Let them know how special they are! And here are some more ideas to help you along the way with your kindness campaign (and please note that I do not profit from any links posted below- these are all suggestions from the heart). 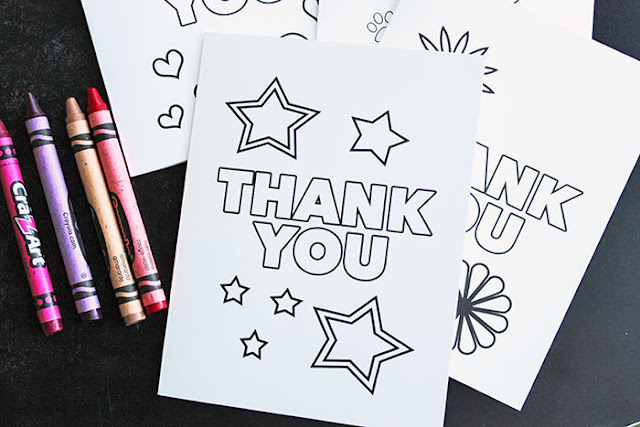 These free printable thank you cards from Sunny Day Family are the perfect way to get your kids involved in spreading some kindness. A little bit of gratitude goes a long way! Consider leaving one of these notes for your mail carrier, your teacher, a store employee, even a friend who has gone above and beyond for you. You won't be sorry you did! Follow Sunny Day's link above for the printables, or click the photo below. We are using our adorable RAK Rabbit this year to learn about Random Acts of Kindness and how to share them. RAK Rabbit comes with a book that has little coupons in the back of it. You can leave these Random Acts of Kindness Coupons for people wherever you go. We plan on putting one Random Act of Kindness coupon on a gumball machine at the supermarket with a few quarters beside it. Pretty easy, right? Then another kiddo can enjoy a free treat! If you've never seen the Let's Do Some Good Today site, you should check it out! I love this idea for Spring, to 'egg' a neighbor. 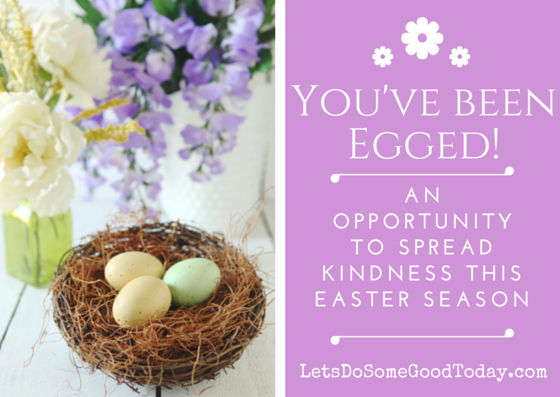 All you have to do is make a small basket of goodies and leave it on a neighbor's doorstep. It's that simple! They even include some free printables so you can put together your own little basket of happiness for a kind neighbor. Find everything you need to 'egg' a neighbor here, or click the photo below. These are just three simple suggestions to help spread kindness, but there are so many other ways to show people you care. I hope you'll take some time today to let someone know you love them, which is the best way of all to let the light shine. In memory of Melissa Matters and my nephew Joey . May you always know how much you mattered to us. We love our RAK rabbit. It's the sweetest thing! Such a neat idea for Easter. I love doing random acts of kindness in memory of those we've lost. What a great way to honor them! I will look for a way to honor Melissa and Joey today. Blessings! What a great way to honor Melissa and your nephew. This weekend we're donating toys, clothes and handmade scarves to one of our local charities. I love giving back and teaching my children about kindness and compassion through action. What a beautiful way to pay tribute to your loved ones. I'm always doing little random acts of kindness. I love spreading joy when ever I can. I love the idea of doing random acts of kindness. I want to get my kids involved in this, too! So many great ideas. I really want to get a RAK Rabbit for my girls now :) Thanks so much for spreading this message!! !